France’s First Lady Brigitte Macron is known for her impeccable sense of style, and her latest look is no exception. 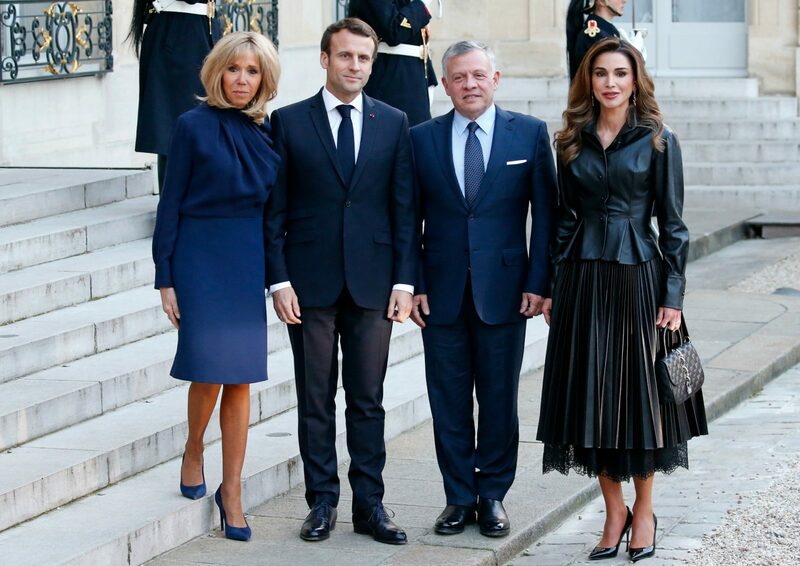 The 65-year-old, who has been married to French President Emmanuel Macron, 41, since 2007, put her best style foot forward on Friday as she joined her husband in welcoming the Jordanian King and his wife to the Elysee Presidential Palace in Paris. Wearing a stylish navy top and skirt, the first lady looked beautiful standing with Jordan’s King Abdullah II and his wife Queen Rania. The former teacher, who met Macron when he was her teenage pupil, added sky-high black stilettos to the classy look, and wore her blonde hair loose over her shoulders. Meanwhile, Queen Rania looked equally as stylish in a black leather, cropped jacket which she paired with a flowing pleated skirt and matching heels. Meanwhile, the Fresh first lady proved she is every bit the fashion icon as she stepped out in another glamorous outfit earlier this month to attend a charity gala. Brigitte looked elegant in a yellow shift dress with a classic black trench coat for the occasion. She added sky-high black stilettos and a ladylike structured handbag to the classy look, and wore her blonde hair loose over her shoulders. The shift-dress-and-classic-coat pairing is a look she’s made work for her on a number of engagements already, having worn a red dress with a matching red, knee-length coat with button details when meeting Prince Frederik of Denmark and his wife Princess Mary in August last year. The French first lady also turns to another tried-and-trusted classic ensemble — a jacket over a matching dress – for official occasions, including when she welcomed US President Donald Trump and his wife Melania to France in November last year. For the occasion, Brigitte opted for a knee-length blue skirt and matching jacket with gold studs across each shoulder and down the side of the skirt. She coupled the stylish look with blue heels and wore her blonde hair loose over her shoulders. The First Ladies stole the limelight in knee-length dresses. Source: Getty. 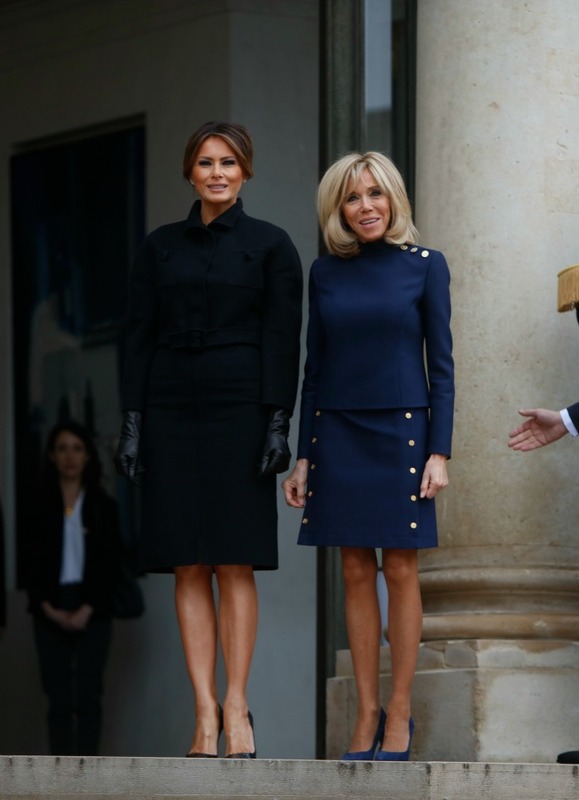 Did you like Brigitte Macron’s latest outfit? Have you developed a signature style that you stick to?